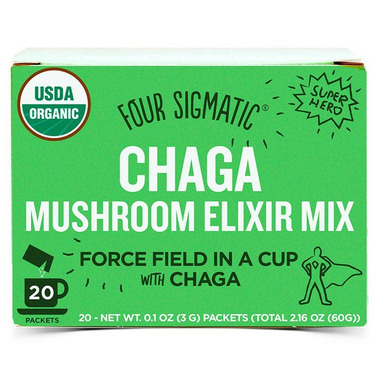 The main ingredient the Four Sigmatic Chaga Mushroom Elixir Mix is - you guessed it- pure wild-crafted chaga mushroom. Each serving includes 1,500 mg of chaga extract with at least 30 percent polysaccharides (including more than 15 percent beta-glucans) and 2 percent triterpenes, which have antioxidant properties and can support immune function. No starch, sugars, or any fillers at all. To make it easy to use, Four Sigmatic has dual-extracted it for you. This means that the active water- and fat-soluble components have been extracted with boiling water and alcohol, respectively. After removing the alcohol and concentrating the extract, it was spray-dryed back to powder. Four Sigmatic considers the environment in everything they do, so when the chaga pieces are collected from the birch trees, only the outer sclerotium is removed; the mushroom itself is left to reproduce on the tree. Organic Eleuthero: Also known as Siberian ginseng, eleuthero is an adaptogen that works synergistically with chaga. Each packet has 750 mg of naturally grown and concentrated eleuthero root extract. Organic Rose Hips: Four Sigmatic has always held these beautiful, deep red Vitamin C bombs close to their heart. As kids, they used to play with the “itching powder” from the inside of the fruits; later on, they started eating them as a tasty roadside snack. 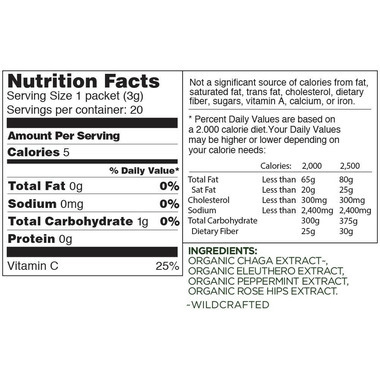 Each packet has 15 mg of natural Vitamin C from the rose hip extract (25% RDI). Organic Peppermint: Delicious peppermint leaf is in the combo to add a nice minty touch to the taste. Add one packet to 8 fluid oz. of hot water. Try also blending it into your favorite smoothie or mixing it in your coffee. Drink this beverage in the morning to kick your day off right. Drink when you're looking to support your body’s immune function. All Natural, USDA Certified Organic, Sugar Free, Vegan, Paleo, Gluten Free, Allergen Free, Caffeine Free, No Fillers. WARNING: Consuming this product can expose you to chemicals including Acrylamide, which is known to the State of California to cause cancer and birth defects or other reproductive harm. For more information go to www.P65Warnings.ca.gov/food.